How does the new Automap controller feel? 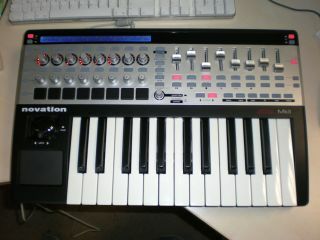 Novation's SL Mk II, fresh out of its wrapping. Launched at the Frankfurt Musikmesse earlier this month, Novation's SL Mk II range represents the next generation of the company's 'intelligent' controller technology. As well as offering new functionality, the updated models (there are three keyboards and one with just knobs, faders and buttons) are physically different to their predecessors, too, and our colleagues over at Computer Music magazine have been getting hands-on with the 25-note version. They report that the drum pads feel much improved, and that the LED rings round the knobs should make it easier to work out current values. All buttons are now backlit, while knobs and faders are touch-sensitive. You can check out Computer Music's full SL Mk II unboxing report on their blog. We'll bring you an in-depth review on MusicRadar ASAP.